Rover Sport White on Clear Window or Car Body Sticker. 8". A single Rover Sport style sticker. Printed in White ink on to a Clear vinyl, allowing the surface the sticker is applied to to show through in none printed areas (i.e. the Black in the picture is not part of the sticker). Available as either a regular sticky backed Vinyl sticker, designed for use on the outside of car bodywork, etc. Or as a sticky fronted Face Stick sticker, designed for use on the inside of a window facing outwards. Machine cut to rounded oblong shape. Sticker measures approximately 200mm x 35mm. RAC Modern Style Sticker. 2" or 3". 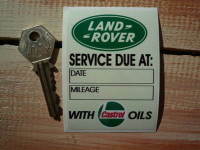 Land Rover Laser Cut Self Adhesive Car Badge. 2.5". Land Rover HUE 166 Sticker. 3" or 4". Aston Martin. Winged Logo Stickers. Set of 4. 60mm. Lotus Racing 1/2 Union Jack Style Oblong Sticker. 4". 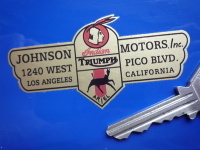 Johnson Motors Inc Dealers Sticker. 3". Coombs of Guildford Portsmouth Road Black & Gold Sticker. 8". BMW Gunsight Style Roundel Stickers. 50mm, 60mm, 70mm, or 80mm Pair. Land Rover Solihull Warwickshire, England Sticker. Various Colours. 6". Air Cleaner Oil Change Sticker. Land Rover, etc. 3". AC Air Cleaner Wash In Petrol Every 5,000 Miles. Black & White Sticker. 2".